20% higher insert performance, up to 1400x faster queries, and simpler queries when using TimescaleDB vs. MongoDB for time-series data. Time-series data today is popping up in many places: DevOps and monitoring, industrial manufacturing, financial trading and risk management, sensor data, ad tech, application eventing, smart home, autonomous vehicles, and more. The biggest challenge with storing time-series data is scale: the data piles up very quickly. And while we think SQL is definitely scalable (and are happy to tell you how), a lot of people’s first thoughts go to NoSQL (i.e., non-relational databases) when they want to scale. Enter MongoDB. MongoDB is among the best known NoSQL solutions, emerging at the end of the last decade to become the face of NoSQL and the foundation of a nearly $2 billion company. Initially used as a simple document store for web apps to prototype quickly and scale easily, its proponents now boast its usefulness across a variety of domains, including time series. But is it really the right solution for time-series data? We decided to evaluate for ourselves to answer that question, even trying multiple methods to make sure we were fair to MongoDB. Our conclusion is that while MongoDB’s JSON-like document store may make it a jack-of-all-trades type of database, and perhaps a master of some (e.g., web applications), time-series is not one of them. For this analysis, we evaluated MongoDB vs. TimescaleDB, an open-source time-series database architected for fast ingest, complex queries, and ease of use. Packaged as a PostgreSQL extension, TimescaleDB looks like PostgreSQL to the outside world and inherits the reliability, tooling, and vast ecosystem of PostgreSQL. In particular, we evaluated two methods of using MongoDB as a time series database: (1) a naive, document-per-event method and (2) a method recommended by MongoDB users (and MongoDB itself) that aggregates events into hourly documents. The first method has fast writes and is extremely simple to implement, but offers poor query performance and disk space usage. The second method achieves good query performance on simple queries, but has worse write performance, higher implementation complexity, and fails to deliver good query performance on more complex time-series queries when compared to TimescaleDB. Comparable (method 1) to 20% better (method 2) write performance. Faster queries, often ranging from 5x to even 1,400x improvements. Far simpler implementation, especially when compared to method 2. Below is a detailed set of benchmarks that compare TimescaleDB versus MongoDB 3.6 (chosen because it is the latest production release) across inserts, queries, and ease-of-use. Before diving into write and read performance numbers, let’s take a moment to examine in more detail the two methods we evaluated for storing time-series data in MongoDB. Conceptually and in implementation, this method is very simple, so it seems like a tempting route to go: batch all measurements that occur at the same time into one document along with their associated tags, and store them as one document. Indeed, this approach yields very good write performance (and in our tests, noticeably higher than others have reported), and it is easy to implement. However, we’ll see later that, even with indexes, the query performance with this method leaves a lot to be desired. Further, this method eats up disk space, using up nearly 50% more than method 2. This method does make it possible to do some efficient filtering when it comes to queries, but comes with a more cumbersome implementation and decreased (albeit not terrible) write performance. For example, to efficiently manage writes, a client-side cache of which documents are already made needs to be kept so that a more costly “upsert” (i.e. insert if it doesn’t exist, otherwise update) pattern is not needed. Further, while queries for this method are typically more performant, designing the query in the first place requires more effort, especially when reasoning about which aggregate documents can be filtered/pruned. Finally, this approach limits the granularity of your data. In particular, if you wanted to support millisecond precision, you would have to change the design to aggregate on a minutely basis, as the max document size in MongoDB (16MB) does not lend itself to further nesting. Beyond millisecond precision is probably infeasible. Because the data in our evaluation was only at the granularity of seconds, however, and given the query performance we measured, we ultimately decided that this method is probably the best method for comparison against TimescaleDB. We do include write performance numbers and some query numbers for Mongo-naive to show how we reached that conclusion. Because NoSQL databases typically trade off some guarantees of relational databases, most engineers would expect MongoDB to achieve better write performance/throughput, making it an inviting choice for ingesting time-series data, which can be at a rate of thousands of readings per second. While it’s true that plain PostgreSQL does tend to lose write throughput as the dataset size grows, fortunately TimescaleDB’s chunking mechanism keeps write performance high. As a result we find that our write performance is actually comparable to MongoDB at its fastest (Mongo-naive), as shown in the figure below. These insert numbers were achieved using 8 concurrent clients inserting data into each setup. 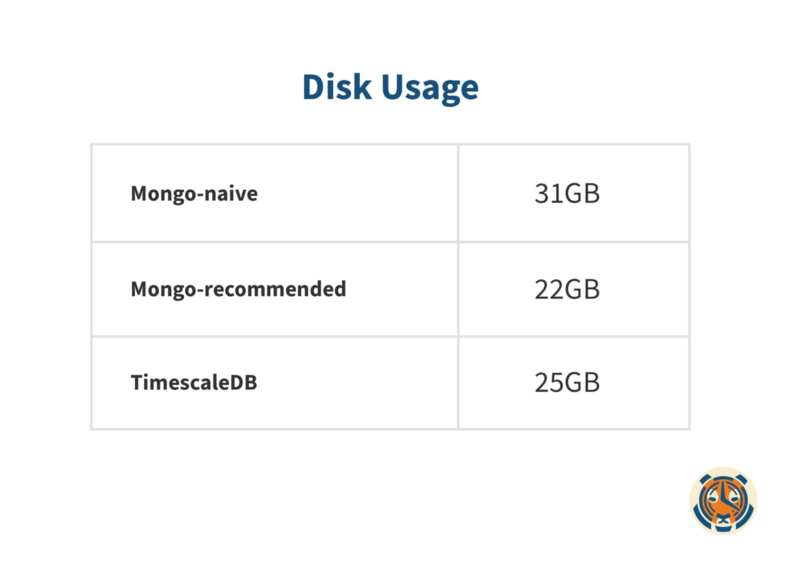 The simplicity of Mongo-naive has it outperforming Mongo-recommended by over 20%, but TimescaleDB is able to achieve similar performance (nearly 1M metrics per second). All three setups do achieve write performance that makes them suitable for time-series data, but Mongo-naive and TimescaleDB certainly stand a cut above. Mongo-recommended experiences extra cost in having to occasionally make new larger documents (e.g., when a new hour or device is encountered). But, while Mongo-naive is indeed fast for writes, it suffers significantly when it comes to query performance (as we’ll see below). Ultimately that poor performance makes it an impractical setup for time-series data overall. 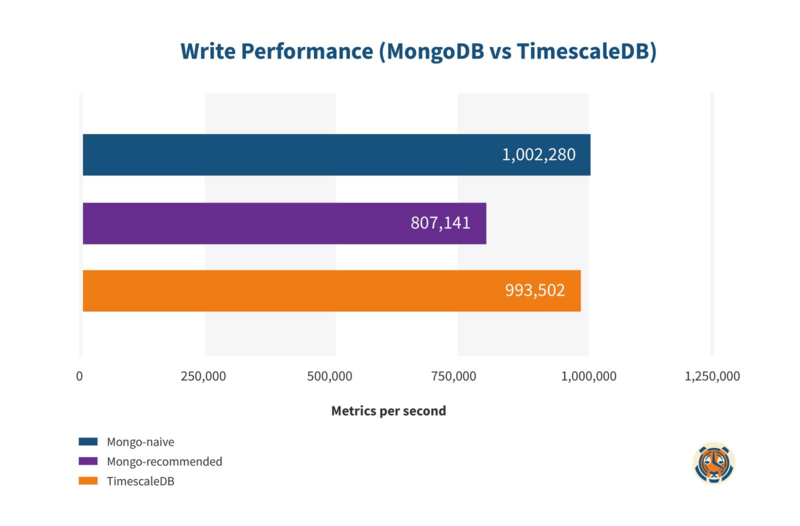 Therefore, for MongoDB’s most practical setup (Mongo-recommended), TimescaleDB achieves write performance that is >20% over MongoDB. Before we compared MongoDB against TimescaleDB, we first considered the query performance between the two MongoDB methods. By this point, Mongo-naive had demonstrated better write performance with a simpler implementation at the cost of additional disk usage, but we suspected that Mongo-recommended would outperform Mongo-naive for query performance. And if there were a clear winner between the two methods for MongoDB on simple queries, we could save ourselves some time by not implementing our full query set against both methods. So we first compared the two MongoDB methods using 3 “single rollup” (groupby) queries (on time) and one “double rollup” query (on time and device hostname). The three single rollup queries were run in 500 different permutations (i.e., with random time ranges and hosts) and the double rollup query was run in 100 different permutations, from which we recorded the mean and standard deviation. Mongo-recommended out performs Mongo-naive by 2x-20x depending on the query. 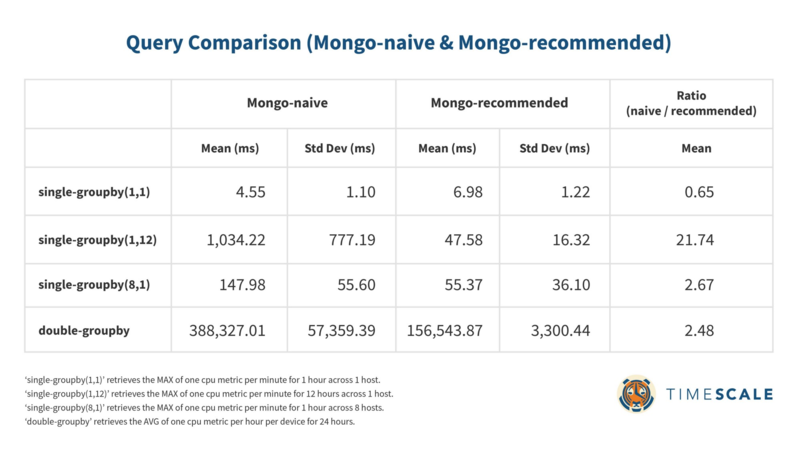 Mongo-naive does outperform Mongo-recommended on the shortest query (shaving a few milliseconds), but aside from that, it is anywhere from 2x slower up to nearly 22x slower than Mongo-recommended. Given this significant difference in query performance compared to the more modest different in write performance (a loss of 20% for Mongo-recommended), we decided that the recommended approach from MongoDB and others was indeed probably the best setup for time-series data. Thus, the remainder of this post, we use the “Mongo-recommended” setup whenever benchmarking MongoDB. Having settled that, let’s move on to comparing MongoDB and TimescaleDB. The results (mean query latency) here are a bit mixed, with TimescaleDB performing better on one, MongoDB performing better on another, and a third being pretty much a tie. All in all, the the raw difference in milliseconds make most of these queries roughly equivalent in a practical sense. While single rollups are pretty comparable across the two systems, other more complex queries are not. Turning back to the ‘double-groupby’ query used previously, where the rollup occurs on time and on device name, we can see where TimescaleDB shows big gains. In the table below, we show one metric being aggregated and also 10 metrics being aggregated. TimescaleDB is between 4–6x faster than MongoDB in these cases. And now that the queries may take 10s of seconds (rather than milliseconds), those kind of differences are very noticeable. Finally we look at two types of queries where TimescaleDB outperforms MongoDB by an ever wider margin. First is a query (‘lastpoint’) that finds the latest reading for every device in the dataset (quite often seen in some use cases, e.g., IoT). Ouch. That’s not good for MongoDB. Yet, that’s not even the worst result! This is tricky because those last 5 intervals could be the 5 minutes prior to the end time, or if there is no data for some minute periods (i.e., “gaps”) they could be spread out, potentially needing a search from the beginning just to find all 5. For a little extra analysis, we compared the query language differences between TimescaleDB and MongoDB for that last “groupby-orderby-limit” query. As we can see, not only is TimescaleDB much more performant, but the query language (i.e., SQL) is also much simpler and easier to read (a crucial criteria for sustainable software development). And here’s that same query expressed in MongoDB. First, for efficiently stopping the query, the client running the query will have to compute the subset of documents to look in, which creates the lengthy list in the first $match aggregator below. Second, to unpack the 60x60 matrices in each document, the $unwind/$project/$unwind pattern is needed to efficiently expand those matrices while removing empty time periods. This pattern is actually needed for almost all of the queries we looked at here, which makes all the queries verbose and potentially daunting to debug. Is it surprising that a time-series database like TimescaleDB out-performs a general purpose document store when it comes to time-series data? Not exactly, but there are enough blogs, talks, and other material out there showing that people are using MongoDB for time-series data that we felt we needed to do an evaluation. Understandably, for many users, MongoDB seems to offer the benefit of ease-of-use and a quick setup time. Yet, for time-series data, setting up MongoDB to actually be performant is not simple and requires careful thought about your document design. If you just dump each reading into a new document, you’re in for bad time when the data accumulates and you want to start querying it. And if you’re going to take the time to write all the client-side code for its recommended time-series method, you’ve already done a lot more work than you would need to setup and start using TimescaleDB. MongoDB may be a great non-relational document store, but it just isn’t that great for time-series data. So for time-series data with TimescaleDB, you get all the benefits of a reliable relational database (i.e., PostgreSQL) with better performance than a popular NoSQL solution like MongoDB. Based on our analysis, TimescaleDB is the clear choice. If you’d like to learn more about TimescaleDB, follow us on Twitter and join our Slack community. If you are interested in working for us, we are hiring! How a 5 node TimescaleDB cluster outperforms 30 Cassandra nodes, with higher inserts, up to 5800x faster queries, 10% the cost, a more flexible data model, and of course, full SQL. A detailed primer on scaling PostgreSQL via streaming replication (with performance measurements).